Have you ever tried this experiment? Have you ever tried to bathe in a tub full of hot sauce? Imagine how fiery would it be! It may also prove to be your worst decision ever. If there were prizes being given for such a daring task, this one might win. As thought by a YouTube star, he made a video of himself bathing in a tub full of hot sauce. Camre Candar, is a successful video maker and his videos of him swimming in a tub of melted chocolate and Oreos have gained him enormous success previously. Inspired by his previous success, he decided that his next attempt should be with hot sauce. Since August 2, the video showing the YouTuber filling his tub with 1,250 bottles of hot sauce, has received over 2.4 million views. “All hot sauces were about to expire so no money or hot sauce were wasted in this video.” Because that’s the major concern here, to add to the firing sensation, he adds red chilies into the mix. 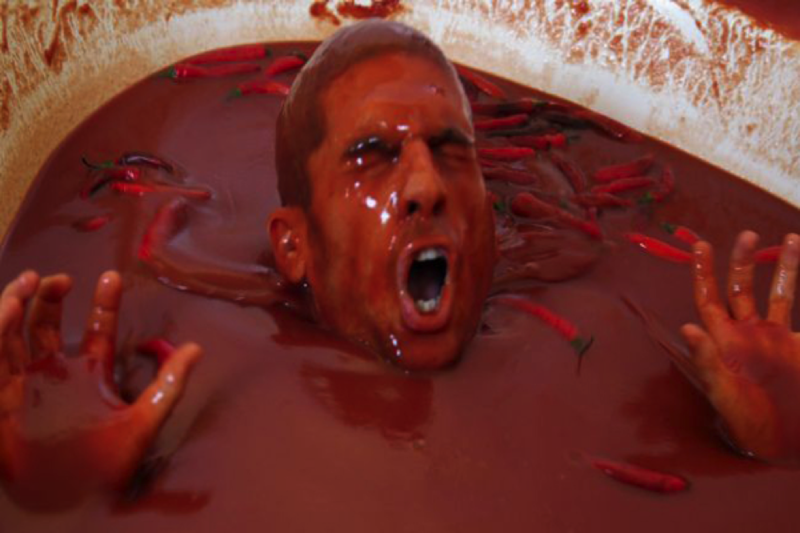 As soon as he took a nice dip in his hot sauce bath, and if we say he regretted his action at once, it would be a grave understatement. But, just one dip was not enough, so he took his attempt a notch higher. By now, both the YouTuber as well as the audience who’ve watched this video must have understood that there is huge difference between hot sauce and chocolate.